We spend our time sitting on the toilet at least a couple of times a day. For this reason, it only makes sense to make answering the call of nature as comfortable as we possibly can. This is the reason why we decided to review some of the best elongated toilet seats present on the market right now. A good toilet seat has to be highly durable and must be able to withstand years of use, and quite possibly, even some abuse. It should also not wiggle the second you sit on it. Most important of all, a good toilet seat should be easy to use and easy to install as well. You shouldn’t need a handyman to fix a simple toilet seat. A good toilet seat, above everything else, has to be extremely comfortable to sit on even for extended periods. In order to help you find the right one for you, we tried out several brands on the market and carefully narrowed it down to the three that we will be reviewing below. Founded in 1901, the Bemis manufacturing company is one of the world’s largest toilet seat manufacturers. The current owners of the company are in the fourth generation of family ownership. All of their toilet seats bring style, innovation, and high quality to commercial and residential properties all over the world. They offer a wide variety of designs that will complement almost any bathroom. 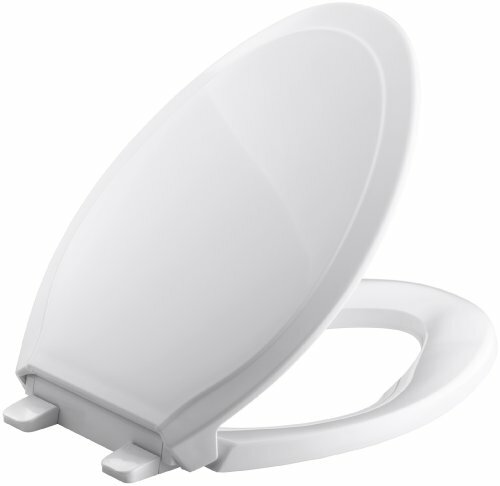 Available in a pack of one, two, three, and five, the Bemis Toilet Seat is a simple and elegant product available in the color white that will most likely suit your bathroom. 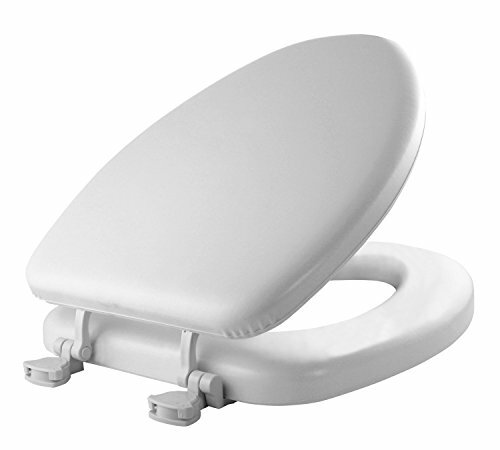 This toilet seat is an ideal choice especially for those looking to fit one in a commercial space as it is made from commercial-grade plastic and is highly durable. The seat weighs about six pounds, and its dimensions are 18.8 by 14 by 2.2 inches. It is made in the United States using earth-friendly materials as well as processes. The best part of this toilet seat is that it can fit on all elongated toilets. These include toilet from brands like American Standard, TOTO, Kohler, and several more. 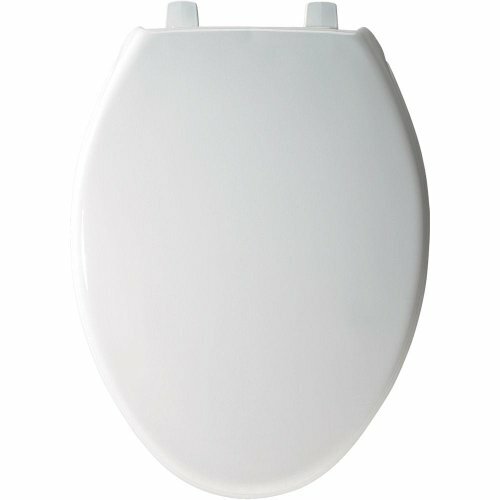 In terms of the built, the company has gone all-out by featuring a non-corrosive 300 series stainless-steel posts and pintles, which make this a heavy-duty toilet seat. Furthermore, the cover is made from an injection molded solid plastic. This toilet seat complies with the IAPMP/ANSI Z124.5-2013 too. Installing this toilet seat is an absolute breeze. It will only take you a couple of minutes and needs no instructions. In addition, the seat features the STA-TITE Seat Fastening System. This system ensures that once the seat is fixed, it is not going to move. Next up, we review yet another toilet seat from the Bemis company. What makes this one better than the other? Let’s find out by looking at its features and the pros and cons that come with using it. The Bemis Mayfair Soft toilet seat is slightly different from the previous one. One very obvious difference is that it comes in ample color options. You can choose from colors like white, black, bone, light blue, dark green, and pink. Most of these colors are unique and quite difficult to find in other brands. In addition to that, unlike the other toilet seat from the same company, this one comes with a soft cushion vinyl. This cushioned seat with a wooden core ensures that it is durable and long-lasting while also being exceptionally comfortable to sit on. The dimensions of this seat are 18.91 by 14.13 by 3.44 inches, and it fits most elongated toilets. It weighs just around 5.75 pounds. You can also choose to buy this seat for round toilets. For your convenience, this toilet seat can be easily attached and removed. This feature allows for quick and thorough cleaning and replacement. All you need to do is twist the hinges to remove the toilet seat. The Kohler Co. is a brand founded by John Michael Kohler back in 1873. This is an American manufacturing company that is based in Kohler, Wisconsin but is known and well-loved all over the world. While Kohler is best known for their plumbing products, the company is also recognized as a trusted manufacturer of cabinetry, tile, engines, furniture, and generators. Kohler products are sold all over the world and are considered to be the best in its class. There are some people who like to remain loyal to one brand. So, if you have a Kohler toilet, you may likely even want a Kohler toilet seat. If that’s the case, then this toilet seat by Kohler is one you will truly like. The seat is available in three color options, which are white, almond, and biscuit. These colors will effortlessly blend with the décor in your bathroom. It weighs just six pounds, and its dimensions are 14.6 by 3.6 by 20.2 inches. While this seat does come from Kohler, it also fits most elongated toilets from other brands. It is made from highly durable and long-lasting plastic, providing you with more bang for your buck. Installing this seat is a piece of cake. It has quick-release hinges that will easily let you remove or attach the seat. This also allows for easy and thorough cleaning. The seat also comes with grip-tight bumpers. These ensure that it does not move around when you sit on it. What we truly liked about it, though, is that it comes with a quiet close mechanism. Kohler’s innovative technology ensures that the lid does not slam into the toilet bowl when you shut it. Instead, it will go down slowly and quietly. So, which of these three toilet seats is the best of the best? Choosing any one of these three best elongated toilet seats will serve its purpose well while effortlessly blending with the décor in your bathroom. It is quite difficult to choose one between these considering how great each of them is, but because the Bemis Mayfair Soft Toilet Seat comes with a cushion, we are leaning towards it. That being said, each of the three toilet seats shares the same excellent quality. Hence, you will not be disappointed choosing any one of them.